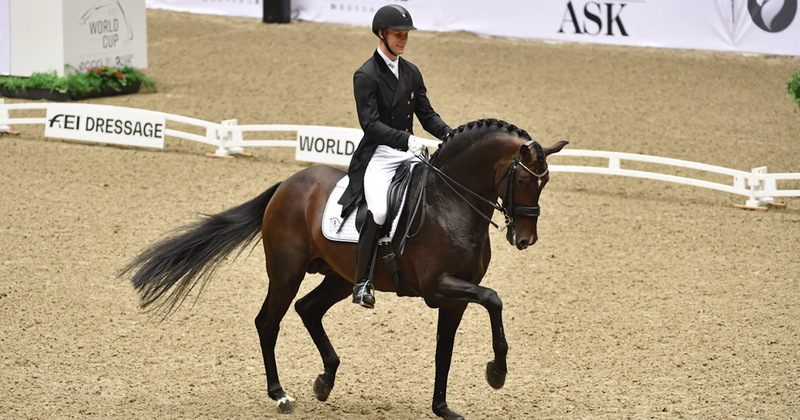 Patrik Kittel has an appetite for scoring big with his Guns N Roses routine in Amsterdam this weekend in what promises to be an incredible FEI Dressage World Cup™ show. The Swede and Delaunay will be rocking their heavy metal moves in front of the Dutch crowds and FEI TV cameras on Saturday as they get in the ring with some of the biggest names in Dressage, including Isabell Werth and Weihegold. In-form Dorothee Schneider, Frederic Wandres and Hans-Peter Minderhoud are also on the start list, with all three – like Kittel - knock, knock, knockin’ on the door of qualification for this year’s FEI Dressage World Cup™ final. Kittel, currently 10th in the Western European League standings with three qualifiers to go, can’t wait for one of his favourite events in the calendar. “I always look forward to Amsterdam,” says Kittel, 42. “It’s such a well-oiled machine that’s perfect for horses and athletes. That is why the best come to Amsterdam. As well as those already mentioned, Dutch favourite Edward Gal – who came second in Amsterdam behind Werth last season – will be there with Glock’s Zonik, as will German favourite Helen Langehanenberg and Damsey, who have been in terrific form. Young Dane Daniel Bachmann Andersen and Blue Hors are also looking for more World Cup points following their win in Herning, with France’s Morgan Barbancon eager to continue a positive campaign so far. This will be Kittel’s third FEI Dressage World Cup™ event of the season and first with Delaunay. Delatio helped him to consecutive second-placed finishes in Salzburg and Lyon earlier this season. Delaunay, the 13-year-old bay gelding, has not competed since an event in Stockholm at the start of December. Kittel’s team can head to Amsterdam with the knowledge that ‘Dude’ took podium positions in his three World Cup outings last year, including a famous victory at Olympia. That London win was secured to the tune of the Guns N Roses medley, which is a routine that has caught the imagination of Dressage fans in recent years. Patrik loves performing it, and told FEI.org that the routine gives him the opportunity to express himself, as well as offering equestrian fans something new. Looking to this weekend, Patrik says: “When it comes to performances, I just want to do my best and we’ll see where we end up. “I will be performing my Guns N Roses freestyle. It’s very different - a bit out there! However, it fits me and my horse really well. “Sometimes the freestyles just sound a bit the same, and I just want to stand out and also mostly I want to ride to music that makes me, the horses and the audience happy - and a bit of rock has never hurt anyone! Patrik competed with Deja in Amsterdam in 2017 and 2018, finishing third and fourth. His previous best in the Dutch city was third with Watermill Scandic in 2011. The Swede told us all about his relationship with 'Dude' last year, when he also revealed that he knows all 10 series of Friends off by heart! Read it here. Amsterdam is the eighth of 10 Western European League qualifiers leading up to the Gothenburg final in April. The qualification campaign began in Herning, Denmark in October as Bachmann Andersen took victory ahead of Langehanenberg and the Netherlands’ Tinne Vilhelmson Silfven. Werth took first place in Lyon - with Swedes Kittel and Antonia Ramel in second and third – and Stuttgart, where Schneider and Langehanenberg completed an all-German podium. Spain's Beatriz Ferrer-Salat took the top spot ahead of compatriot Claudio Castilla Ruiz and Portugal's Maria Caetano in the fourth leg in Madrid. Kittel and Delatio came second in Salzburg, where Benjamin Werndl was victorious and Schneider came third. Wandres took top spot at Olympia in December, just ahead of Charlotte Dujardin. Minderhoud and Glock’s Dream Boy came third in London and then recorded a terrific win in Mechelen last time out, finishing ahead of Langehanenberg and Portugal’s Caetano. Werth will look to defend her FEI Dressage World Cup™ title in Gothenburg, with the champion to crowned on April 7. Werndl and Schneider currently lead the Western European League standings with 65 points each, while Minderhoud and Caetano are joint third on 59 points. Langehanenberg, Wandres and Barbancon are placed fifth to seventh. Vilhelmson Silfven, Germany’s Fabienne Muller-Lutkemeier and Kittel complete the top 10 with three events to go before Gothenburg. The good news for Kittel is that he will have his home crowd behind him in Gothenburg, and he set a new personal best in the city last year! “Getting 10 for music and 10 from a couple of judges for difficulty was special,” he recalls.